When in 1899 the Seoul streetcar began its operations, its fleet consisted of nine carriages. Eight were designed for normal passenger service while one was specially built for his majesty’s convenience. Kojong used this personal tramcar when he visited the tomb of his wife Queen Min. When in 1897 the first modern Korean bank issued its first loan, the loan had to be secured against the only property the borrower had in his disposal, his donkey. The loan was repaid at time, but for few days bank managers had to take care of the animal. In the 1930s the Western restaurants were almost absent in Seoul, so if somebody wanted to eat a decent Western-style meal, the only solution would be to go to a Seoul station restaurant, The Grill. More or less all Korean industrialists or politicians, including all president of the 1948-1980 period, visited the place a number of times. When in the 1920s the taxi service began to spread in Korea, most cabs had no meters, so the fixed rate was introduced. It would cost one won to travel to any location within the city limits. In those days this roughly equaled daily earnings of an unskilled laborer. In the 1890s, some mountain pass near Seoul were considered dangerous because of frequent tiger attacks. In 1915 alone, hunters killed 11 tigers nationwide. The last tiger in South Korea was killed as recently as 1921 in Northern Kyongsang, and the last confirmed sighting occurred in 1946. The Chinese began to settle in Korea only in the 1880s, but by 1945 there were some 100,000 ethnic Chinese residing in Korea. Among them there were tycoons who were seen as richest people in the country, but a majority of the Chinese were unskilled construction workers and vegetable farmers. In 1955 a small workshop bearing the proud name of the International Car Company began to manually assemble US Jeeps. Thus inauspiciously began the history of the Korean automobile industry, now one of the world’s largest. In the 1960s the Korean government believed that excessive growth of population would undermine the economic growth. So, they waged one of the world’s most successful family planning campaigns. In the 1990s, it was the low fertility rate and population aging which came to be seen as major demographic problems in Korea. 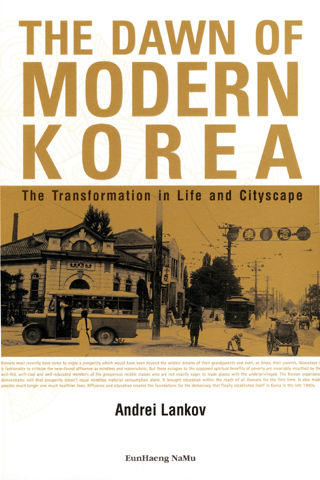 These and many other facts about changes of the Korean life over the last 150 years can be found in the new book by Andrei Lankov, titled Dawn of Modern Korea. The book is based on the widely read columns Andrei Lankov writes for the Korea Times since 2002. Dawn of Modern Korea deals with those parts of history which are often seen as ‘too mundane’ to be taken seriously. This is the book about daily life of Korea in the 130 years which followed the ‘opening’ of the country to foreign exchanges. It treats changes in the food, dress, good and bad habits, it pays attention to how Korean traveled to work, what they did in their leisure time, how did they interact with their friends and relatives. There are many countries which are more successful than Korea. However in most cases their current prominence is a result of long centuries of economic growth. The list of the most wealthy nations has not changed much since the early 1900s and in most cases the word ‘developing’ in the expression ‘developing countries’ is scarcely more than a polite euphemism to describe a state of backwardness and hopeless poverty. Only a handful of developing countries have managed to break away from poverty and repression and almost none of them have made this break with anything approaching Korea’s speed and efficiency. In the early 1960s Korea was a developing country and even by the unenviable standards of this group it was not doing particularly well. Its per capita GNP was equivalent to that of Papua New Guinea and Nigeria. Nowadays it can compare itself with some of the less successful members of the European Community. Automobiles are everywhere in Korea. But the mass production of the cars in Korea only began in the 1970s. Korea is the world’s leader in Internet access, but as late as 1980 it had no color TV broadcasts. Korea is one of the world’s most university-oriented societies, but in 1945 less than a quarter of its population had any formal schooling. 1897년 한국 최초의 근대적 은행이 처음으로 대출을 기록했는데, 이 대출금의 담보물은 채무자의 전 재산이자 유일한 재물인 당나귀였다. 이 별난 대출은 채무자가 제때에 상환함으로써 무사히 마무리 되었으나 해당 은행의 행원들은 며칠 동안 이 번거로운 ‘담보물’을 보살피는 노고를 감수해야 했다. 지금 생각하면 우습기만 한 이 이야기는 고작 110년 전에 벌어진 실화이다. 20세기는 세계 각국 모두 거대한 변화의 시기였다. 그러나 그 어느 곳도 한국처럼 드라마틱한 움직임을 보인 곳은 없다. 한국은 약 150년이라는 짧은 세월 속에 이러한 다양한 사건들을 겪으며 크게 변화했다. 북한과 한국 역사에 대해 국내외적으로 권위를 갖고 있는 안드레이 란코프 박사는 신간 (은행나무 刊, 전문 영어)를 통해 그동안 우리에게 알려지지 않은 보다 다양하고 흥미로운 근현대 한국의 모습을 소개하고 있다. 이 책은 저자가 2002년부터 Korea Times를 통해 소개했던 동명의 칼럼을 엮은 것으로 지금까지 다소 ‘통속적’이라는 평가를 받으며 자세히 다루어지거나 본격적으로 연구되지 않은 부분들에 관해 주로 다루고 있다. 이로 인해 한국의 경제, 정치, 사회적 측면은 물론 보다 일반적인 서민들의 생활을 송두리째 바꾼 작지만 필수적인 것들에 대해 살펴볼 수 있는 기회를 제공한다. 저자는 이 책에서 150년 간 외국 문화의 “개방”을 통해 우리 사회에서 일어난 소소하지만 절대 그 가치가 폄하될 수 없는 일상의 변화와 발전을 다루고 있다. 외국의 문물은 의식주의 다양한 방면에서 큰 변혁을 일으켰으며, 좋은 습관과 좋지 못한 습관을 동시에 불러들였다. 이 시기에 사진과 신문, 영화, 레스토랑, 전기 등이 등장하여 서민들의 문화에 엄청난 충격을 주었고, 지하철과 자동차가 처음 도입되었으며 자연스레 이로 인한 적지 않은 사고도 뒤따랐다. 근대화의 시기에 한국은 이처럼 경제적 발전과 더불어 사회적, 문화적 격변을 겪었다. 지금은 당연하게만 생각되는 문명의 이기들 역시 처음 이 나라에 소개되었을 당시에는 혼란과 갈등을 겪었다. 1960년대 초 한국은 ‘개발도상국’이었고, 이 그룹에 대한 일반적인 기준에서 볼 때 그다지 가능성이 있어보이지도 않았다. 1인당 GNP는 파푸아뉴기니나 나이지리아와 비슷한 수준이었다. 하지만 현재에 이르러서는 유럽의 선진국과 비교해도 뒤쳐지지 않을 만큼 성장했다. 오늘날 도로 곳곳에 자동차가 가득하지만 한국에서 자동차의 대량생산은 1970년대에 들어서야 시작되었다. 한국은 인터넷 인프라 등 IT 분야에서도 따를 자가 없는 리더이다. 그러나 1980년 한국에는 칼라 TV를 송출하는 방송국 하나 없었다. 1945년까지 전 국민의 4분의 1 이상이 정규교육을 받지 못했으나, 현재 한국의 교육열은 세계 최고 수준이며 수많은 대학에서 졸업생을 배출하고 있다. 물론 한국보다 부유한 나라는 많다. 그러나 대부분의 경우 그들의 현재 부는 오랜 세월에 걸친 경제적 성장을 통해 이룬 것이다. 세계에서 손꼽히는 부국들의 목록을 작성한다면 1900년대 이후로 큰 변화가 없을 것이며, 대부분의 개발도상국의 경우 ‘개발도상국(developing country)’이라는 표현은 ‘후진국’ 혹은 ‘빈국(貧國)’을 예의바르게 표현한 것에 지나지 않는다. 극히 소수의 국가들만이 가난과 억압에서 벗어났으며, 그조차도 한국이 보여준 놀라운 속도와 효율과는 비교할 수 없을 정도이다. 처음 서울에 전차가 운행된 것은 1899년. 당시만 해도 전체 전차의 수는 겨우 9대뿐이었다. 택시 사업은 1920년에야 비로소 시작되었으며, 1930년대까지 서울 시내에도 서구식 레스토랑은 찾아보기 힘들었다. 유일한 서구식 레스토랑이라 할 만한 ‘그릴The Grill’에는 많은 실업가와 정치인, 심지어 대통령들까지 자주 발걸음을 하곤 했다. 그러나 오늘날 한국의 모습은 겨우 몇 십 년 전과 비교할 수도 없을 만큼 비약적으로 발전했다. 이 책을 통해 독자들은 문화적, 사회적 측면에서 이러한 “근대적인 요소”가 어떻게 오랜 세월을 유지해온 한국인들의 삶을 뒤흔들었는지 살펴볼 수 있을 것이다. 1963년 현재는 상트 페테르부르크(Saint Petersburg)로 개명된 러시아의 레닌그라드에서 태어났다. 레닌그라드 주립대학에서 한국역사와 중국역사를 전공했으며 동대학원에서 박사학위를 받았다. 1996년부터 호주 국립대학에서 교수직을 역임했으며, 2004년부터는 국민대학교 국제학부 교수로 재직 중이며, 북한의 사회와 정치 역사와 관련된 리서치에도 참여하고 있다. , 등에 정기적으로 칼럼을 연재하고 있으며, (2002), (2005), (2007) 등의 저서를 출간했다. \"The Dawn of Modern Korea: The Transformation in Life and Cityscape.\"
This intimate portrait of the lives of everyday Koreans, drawn by historian and journalist Andrei Lankov, shows just how much Korean society has changed since the late 1700s. Mr. Lankov begins his study in 1784, when Christianity arrived on the Korean peninsula, and traces through the years to the 1990s, with that decade\"s influx of foreign workers. Along the way, he produces a highly readable and enlightening look at Korea\"s evolution from a poor nation to an economic giant.